Since you so cleverly figured out Kalos’s Champion during your playthrough of X, I challenge you to try and figure out who Alola’s Champion is! No hints, not even whether or not you’ve met them so far. Well, at the moment I don’t think Alola even has a Champion. At the point I’ve reached in the story (obviously I’m ahead of what I’ve actually written, since writing takes time), I’ve learned that Professor Kukui is currently working to form a Pokémon League in Alola; it seems likely that the creation of the League and the selection of Alola’s first Champion are going to be focal points of the rest of the story. That being the case, it seems possible that the story could end with the player being appointed to the position. Kukui himself isn’t out of the question either, since he’s clearly far more martial than other Professor characters. That Hapu chick also seems like a good bet, since she’s clearly very powerful, but doesn’t wear a Captain’s insignia and doesn’t really act like a Kahuna either (she doesn’t hang out on just one island). She just shows up from time to time, helping people and offering advice, which is consistent with the role Champions tend to have in Pokémon games before their formal introduction. If I were a betting man, my money would be on her. How would you design a Champion? I don’t mean in terms of visual design, but personal character and team composition. What kind of profession would they have (if any)? What would their personality be like? What type or theme would they specialize in (if any)? And, of course, what Pokémon would you give them? Well, we’ve had a rival, a superhero, a geologist, a mythographer, an adventurer, a dragon princess, and an actress… what would I like to have next? Maybe… a politician, a leader? Someone whose philosophy revolves around responsibility, duty, and community? This champion is the mayor of a major city that the player visits on their journey. They’re not on the front lines of crises like Lance, Steven or Alder; instead they’re leading from behind, making sure everyone is where they need to be, when they need to be, protecting civilians from chaos, and taking charge in recovery efforts after disasters. In interactions with the player, they constantly stress the responsibility of Pokémon trainers to use their power and skills for the good of all, and challenge the player to think about how their journey is benefiting people and Pokémon other than themselves. In battle, this Champion’s Pokémon are all Normal-types (because Normal-types need some love), focusing on those that value protectiveness, loyalty or industry – Stoutland, Pyroar, Braviary, Diggersby (with Huge Power, of course) and Sawsbuck, with Mega Kangaskhan to cap it all off. What do you think of the various Pokemon Champions? We know its a title of prestige but what do you think it functions as besides that? Like Lance is a secret agent, Steven is an archeologist, Diantha is a model/movie star, etc. I did a series on all the champions a few years ago that goes into wayyyyy more depth than I could justify in answer to this question. Glamorous but relatable, ethereal but down-to-earth, the Kalosian Champion, Diantha, is everything you want in an actress – but how does she stack up as a Pokémon League Champion? She certainly has the look down, with an extravagant costume reminiscent of angel wings, and more importantly she also has the right kind of attitude to Pokémon and training. Sadly – and I may as well be up front about this – the story of X and Y doesn’t give Diantha very much of an opportunity to do anything, something that was rather a disappointment to me. Still, she gets a few good lines, and when you get her into a battle she’s the equal of any of her predecessors, so let’s take a look at her and see what makes this Champion tick. 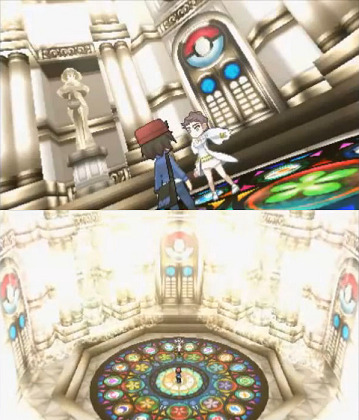 We first meet Diantha in Lumiose City at the Café Soleil, and this scene is probably her most interesting because she has the opportunity to speak directly to Lysandre and set up a compelling argument against his beliefs – even here, the game doesn’t let her have many lines, but she makes them count. Lysandre puts to Diantha the question of whether, as an actress, she would prefer to stay young forever, since it is her duty to inspire people with her beauty. He clearly expects the answer ‘yes,’ but Diantha finds the question bizarre – being forever young would mean playing the same kinds of roles forever, but she views change and age as essential parts of the experience of human life, and eagerly anticipates the variety of more mature characters she will play as she grows older. Their conversation betrays a certain narrowness and superficiality on Lysandre’s part; despite his comment that Diantha’s great contribution consists in “[moving] the multitudes with her excellent acting,” it seems clear that he regards her physical beauty as the most important aspect of her craft – to him, Diantha really is just a pretty face. Her second appearance makes it clear that Diantha herself has a very different understanding of what she does. We meet her again in Coumarine City, where she is talking with Professor Sycamore at the monorail station. Diantha offers some comments on Mega Evolution, suggesting that perhaps the reason it seems to be limited to Kalos is because it has something to do with the legendary Pokémon of the region (if Professor Sycamore is correct in his eventual conclusion that Mega Stones were evolutionary stones irradiated with the energy of the Ultimate Weapon three thousand years ago, she’s not far off – although Xerneas and Yveltal don’t seem to have been directly involved with the weapon’s first use, they command similar powers). More interesting from a characterisation perspective, though, is what she talks about after he leaves. Sycamore had mentioned the bonds between trainer and Pokémon as a critical component of Mega Evolution, and Diantha makes an interesting comparison with the way she approaches acting: she sees it as an exercise in empathy. In order to enjoy a role and play it effectively, Diantha says, she needs to put herself in her character’s shoes and understand what they have in common. She also believes in taking the same approach to interacting with both people and Pokémon. Essentially, the reason she’s both a successful actress and a great Pokémon trainer is because she’s figured out that the two professions share a key skill – empathy – and made it a part of her general approach to life. And that… is the last we see of her. Diantha doesn’t take any further part in the storyline of X and Y until your troubles with Team Flare are all over and you reach the cathedral of the Elite Four. Realistically enough, she seems to have almost forgotten you herself by this point, but quickly realises that she does know who you are and what you’ve done for Kalos after all – which brings us to the battle. Like Blue and Cynthia, Diantha is very hard to pin down to a preferred Pokémon type or battling style. 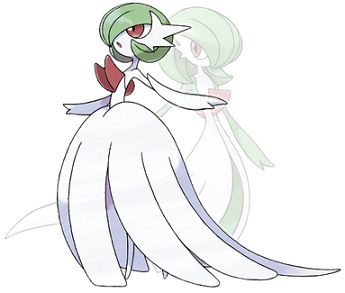 She appears to favour Rock- and Dragon-types, with two of each on her team, but her signature Pokémon, the strongest in her line-up, whose physical appearance is recalled in the flaring white skirts of her coat, is a Fairy/Psychic dual-type, Gardevoir. In Hawlucha, her opener, Diantha has a strong and fast physical attacker with excellent type coverage thanks to Flying Press, Hawlucha’s idiosyncratic signature move, while Tyrantrum adds a sledgehammer to her tool kit. Aurorus provides Reflect and Light Screen support, though with two double-weaknesses it may not last long enough to set up more than one. Goodra is a resilient special tank with a wide variety of powerful attacks. Gourgeist is surprisingly tough and can hit almost anything for super-effective damage by adding the Ghost type to Pokémon with Trick-or-Treat. Last, but most definitely not least, is Gardevoir, who proves that Diantha can put her money where her mouth is when it comes to empathy and bonding with her Pokémon – by using her Mega Charm to Digivolve Gardevoir, Diantha can turn her partner into as great a threat as the whole of the rest of her team put together (as I learned to my cost when I first challenged her and won with my Venusaur’s last three hit points). Mega Gardevoir’s Moonblast and Psychic attacks are phenomenal, more powerful than anything a Champion has brought to bear against us before, and without a Steel-type to resist her primary attacks she is one of the most dangerous single opponents the games have ever produced. 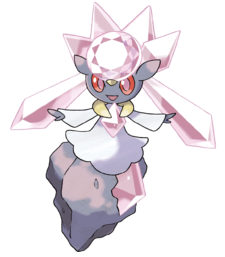 Ironically, Diantha’s greatest vulnerability is probably to Fairy Pokémon, since she has three Pokémon that are weak to their attacks, none that resist them, and only one super-effective attack to hit back with (Hawlucha’s Poison Jab); she also has great difficulty with Ice- and Steel-types. Still, her weak points are certainly less easy to exploit than those of predecessors like Water-type master Wallace and the closeted Flying-type specialist Lance, making her a solid end-game challenge. The variety of Pokémon we see on Diantha’s team – in terms of not only their types and skills but their personalities and dispositions – may be intended to recall her desire for variety in her career and her life. Partly I’m just saying this because I can’t find any other sort of theme to link her team together, but it seems to me that a wide variety of popular film genres have Pokémon representatives on her team; she has action (Hawlucha), horror (Gourgeist), family/comedy (Goodra and Aurorus), disaster (Tyrantrum) and, of course, romance (Gardevoir) all covered. 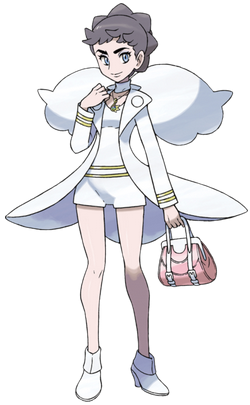 Perhaps that’s entirely in my head and the designers just wanted to give her a diverse bag of the new Pokémon the sixth generation has to offer, but it makes sense, given Diantha’s stated interest in playing a variety of roles, that she might have acted in many different genres, possibly meeting many different Pokémon in the process. One last thing that’s worth mentioning about Diantha is her reappearance in the Café Soleil after the end of the game. Diantha here offers you the opportunity to trade for a Ralts holding the Gardevoirite Mega Stone, so that you can raise a Mega Gardevoir of your very own. This is not in itself particularly interesting; what is noteworthy is that she actually takes the time to think about how the Pokémon involved in this trade feel about it – something I can’t recall any other character in the games ever doing (although, granted, most in-game trades are with random NPCs who have no other discernable purpose in life). “We Trainers all feel a bit nervous when trading Pokémon,” she comments as the trade begins, “but I’m sure it’s nothing compared to how the Pokémon must feel!” When the switch has been completed, she even takes a moment to address the Pokémon you’ve given her directly, asking “was it a bit shocking to be traded?” and promising to care for it to the best of her ability. A tiny detail at the very end of the game, but one that once again demonstrates that Diantha really does know what she’s talking about when it comes to empathy and consistently makes an honest effort to understand the perspectives of her Pokémon on their lives together. On some level Diantha’s non-existent involvement in the Team Flare crisis makes sense, since she’s very clear that she’s only a Pokémon trainer “in [her] off time” – acting is her real career, and for all her power, she’s not really a ‘saving the world’ kind of girl. Still, I find her remoteness from the actual plot as disappointing as I did Iris’s, and I don’t think Diantha even gets as much screen time (ironically) as Iris did in Black and White. Having said that, she makes a good effort to stay relevant in the time she does get – and I can always hope for more in any future games. Though she never gets the chance to be a hero, through her dialogue she does manage to establish herself as a role model for Kalos’ trainers and a champion of a worldview opposite to Team Flare’s. Lysandre wants to put the beauty of the world on a pedestal and keep it from changing for all time, but Diantha wants to engage with and understand beauty, and prefers to embrace change, for better or worse, which, ultimately, is what the central conflict of X and Y is about. Happy New Year! Now, let’s get cracking! I still have no clue what I’m going to fill 2012 with, so please do leave suggestions if you have any (I’ve fiddled with the settings, by the way, so that people who don’t have a Google account or whatever should be able to comment), but for now I can probably waste a good two weeks talking about some of the most important NPCs of the Pokémon series: the League Champions, starting with our dear sweet old-time rival, Blue. Gods, Blue was a douche. This guy is probably the most obnoxious character not only in the series but in the whole damn franchise, in all its incarnations, beating out Charon from Platinum Version, Jessie’s Wobuffet from the TV show, Aria from Pokémon Ranger, the Gengar from Mystery Dungeon Red and Blue, and even bloody Imakuni? from the Gameboy adaptation of the trading card game. As everyone probably remembers, Blue turns up to fight you a number of times over the course of the game, with the encounters generally following a fairly predictable pattern: Blue appears, insults you, makes wild assertions about your incompetence as a trainer and Pokédex-holder, challenges you to a battle, loses, acts as though he had just beaten you, insults you again, and then leaves. He shows no sign of character development, remaining the same unlikable jerk throughout the game, thus providing a gradually accumulating motivation for you to stomp his smug face into the dirt when you battle for the last time at the Indigo Plateau. It’s not even that he dislikes you in particular; he’s just a bad person. During the Team Rocket takeover of Silph Co., when you step in to rescue the terrified employees from the marauding gangsters and keep the Master Ball out of Giovanni’s hands, Blue turns up in the Silph office building near the teleport panel that leads to the president’s room. He’s not there to help; he’s there because he saw you in Saffron City and thought “hey, I’d better have a battle with ol’ snot-breath over there!” Forget the chaos going on all around him; forget the innocent men and women trapped in their offices; forget the lunacy Team Rocket could accomplish with the Master Ball prototype; Blue isn’t going to do anything about that! He’s far too busy slinging insults at his rival! He also never makes any references to his Pokémon as anything other than those things he’s going to beat you with; he’s not an abusive master like Silver but he doesn’t really seem to care much about his Pokémon either, and eventually gets called out on it by his own grandfather, Professor Oak, after losing to you at the Indigo Plateau. Three years later, in Gold and Silver, Blue returns to haunt us, having replaced Giovanni as the Gym Leader of Viridian City and guardian of the Earth Badge. He has apparently never tried to reclaim his former position from the current Champion, Lance; I can only suppose that, in keeping with his usual policy of declaring that anyone who beats him is a loser, he has decided the title wasn’t worth having anyway. When you meet him on Cinnabar Island, he seems to have developed quite the philosophical streak over the past three years and may even have undergone something resembling character development. Then again, he might just still be sullen over losing his title; it’s hard to say. He’s still an inconsiderate jerk, spending weeks at a time away from his gym and thus preventing trainers from challenging him, on the grounds that most Pokémon trainers in Kanto are so far beneath him anyway. It takes a personal request from a trainer with all seven of the other Kanto badges just to drag him away from his new favourite pastime, staring glumly at the basalt-covered ruins of Cinnabar Island and murmuring platitudes about the power of nature to himself; he almost seems depressed when he isn’t fighting. Incidentally, there are a couple of interesting fan theories, based on the events of the first games, that suggest Blue isn’t simply rotten to the core but rather that his general unpleasantness is due to bitterness over the events of his past. Where are his parents, for instance? The only family we ever see are his sister and grandfather. If you believe the speculation, Blue’s parents are both dead – killed in the same war that Lt. Surge fought in (Kanto seems to have disproportionately few middle-aged men; the suggestion is that the whole age group was devastated by the war). Also, what happened to his Raticate? In a couple of early encounters, Blue has a Rattata, which later evolves into a Raticate. The next time you see him, he’s in the Pokémon Tower, an enormous Pokémon cemetery… and doesn’t have his Raticate anymore. He also asks you what reason you have to be there, since “your Pokémon don’t look dead”. Hmm. I think he’s making a joke, since he immediately continues “I can at least make them faint,” and challenges you to a battle (not exactly the actions of a mourner). Although the implications for Blue’s character are interesting, both theories are, I think, reading too much into things; Pokémon doesn’t really ‘do’ subtlety… but that doesn’t make speculation any less entertaining. This lovely piece is by Aragornbird (more of whose work can be found at http://www.arkeis.com/) and portrays the epic showdown between Blue and Red (who reappears in Gold and Silver as a ‘bonus boss’ with the team shown here). Blue is actually the only “rival” character ever to become Champion, and as such his team composition varies according to the starter he chose (whichever one is strong against yours). He always uses Pidgeot, Alakazam and Rhydon. He has a fully evolved Venusaur, Blastoise or Charizard by this point, rounding out his team with two of Arcanine, Gyarados or Exeggutor, leaving out the one whose element matches his starter’s. In the original games, Blue is not as dangerous an opponent as his inflated level suggests, for much the same reason as the Elite Four. The NPC enemies are strikingly unimaginative with their movesets, each Pokémon rarely knowing any attacks besides the ones that would be used by a wild Pokémon of the same species and level… to the point that Blue’s Rhydon knows both Leer and Tail Whip (which have exactly the same effect), his Exeggutor doesn’t even have four attacks, his poor Arcanine and Pidgeot are stuck with Roar and Whirlwind (which don’t actually do anything in Red and Blue except against wild Pokémon), his Arcanine has to make do with Ember just to add insult to injury, and his Charizard, if he has one, actually uses Rage (which, due to the bizarre way it works in Red and Blue, basically confers a death sentence upon anything stupid enough to use it, ever). He is, to be fair, a far more credible opponent in his incarnation as the Viridian Gym Leader (using Exeggutor, Gyarados, and Arcanine, with no starter Pokémon) since his Pokémon now, at least, use sensible attacks, and is further improved by the remakes of the first two generations of games; in Fire Red and Leaf Green, for instance, he eventually replaces his Pidgeot and Rhydon, hardly standout members of his team, with the far more dangerous Heracross and Tyranitar. It’s Heart Gold and Soul Silver, though, that do something really interesting with Blue. Gyms, of course, are normally themed around an element, with trainers in the gym predominantly using Pokémon of the same element as the leader… but Blue has no specialty element. Gold and Silver wimped out when faced with this little disjunction and gave Blue a blandly-decorated gym with no minions whatsoever. Heart Gold and Soul Silver take the far more inventive approach of giving Blue a gym themed around not an element but a technique: Trick Room, a field move that temporarily distorts space to allow slower Pokémon to outrun faster ones. Blue’s gym trainers in Heart Gold and Soul Silver all employ Pokémon with Trick Room, alongside slow but powerful Pokémon that can exploit its effects. Blue uses his Exeggutor, who is now his opener, to set up the effect, and now has a Machamp in place of his old Alakazam to better fit his new strategy. It’s a creative response to the need for a gym to have a theme in the absence of a leader with a preference for any particular type, and personally I think it would be good to have more gyms like this in future games (but that’s a discussion for another day). So, that’s this guy. He’s loud and unpleasant, not actually evil but remarkably inconsiderate, short-sighted and power-hungry, and he’s honestly not even a very good trainer (well, okay, I have to forgive him for that one since all the NPCs in Red and Blue have pretty terrible movesets and AI). I don’t know that he’s particularly interesting in terms of his personality, but I suppose he’s not a bad antagonist in the sense that he’s easy to dislike and provides a solid, uncomplicated example of what you, the player, are supposed to be trying not to be. Personally, I’d keep him around, if only because he’s the guy we all love to hate. Oh, wait; I keep forgetting I’m not doing that anymore. But I have to finish with something… oh, I know.